Mr. PAUL. Mr. Speaker, I rise today to introduce the Freedom and Privacy Restoration Act, which repeals those sections of the Illegal Immigration Reform and Immigrant Responsibility Act of 1996 authorizing the establishment of federal standards for birth certificates and drivers licenses. This obscure provision, which was part of a major piece of legislation passed at the end of the 104th Congress, represents a major power grab by the federal government and a threat to the liberties of every American, for it would transform state drivers licenses into national ID cards. If this scheme is not stopped, no American will be able to get a job; open a bank account; apply for Social Security or Medicare; exercise their Second Amendment rights; or even take an airplane flight unless they can produce a state drivers license, or its equivalent, that conforms to federal specifications. Under the 1996 Kennedy-Kassebaum health care reform law, Americans may even be forced to present a federally-approved drivers license before consulting their physicians for medical treatment! Mr. Speaker, the Federal Government has no constitutional authority to require Americans to present any form of identification before engaging in any private transaction such as opening a bank account, seeing a doctor, or seeking employment. The establishment of a national standard for drivers licenses and birth certificates makes a mockery of the 10th amendment and the principles of federalism. While no state is forced to conform their birth certificates or drivers licenses to federal standards, it is unlikely they will not comply when failure to conform to federal specifications means none of that states residents may get a job, receive Social Security, or even leave the state by plane? Thus, rather than imposing a direct mandate on the states, the federal government is blackmailing states into complying with federal dictates. Of course, the most important reason to support the Freedom and Privacy Restoration Act is because any uniform, national system of identification would allow the federal government to inappropriately monitor the movements and transactions of every citizen. History shows that when government gains the power to monitor the actions of the people, it eventually uses that power to impose totalitarian controls on the populace. I ask my colleagues what would the founders of this country say if they knew the limited federal government they bequeathed to America would soon have the power to demand that all Americans obtain a federally-approved ID? If the disapproval of the Founders is not sufficient to cause my colleagues to support this legislation, then perhaps they should consider the reaction of the American people when they discover that they must produce a federally-approved ID in order to get a job or open a bank account. Already many offices are being flooded with complaints about the movement toward a national ID card. If this scheme is not halted, Congress and the entire political establishment could drown in the backlash from the American people. National ID cards are a trademark of totalitarianism and are thus incompatible with a free society. In order to preserve some semblance of American liberty and republican government I am proud to introduce the Freedom and Privacy Restoration Act. I thank Congressman BARR for joining me in cosponsoring this legislation. I urge my colleagues to stand up for the rights of American people by cosponsoring the Freedom and Privacy Restoration Act. This statement, inserted in the Extensions of Remarks, is on the same theme as a speech Ron Paul delivered on the House floor in 1998 Ron Paul Chapter 75. 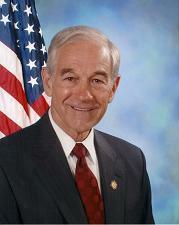 1998 Ron Paul 76:6 federally-approved probably should not be hyphenated: federally approved. 1998 Ron Paul 76:8 I thank Congressman BARR Here, Ron Paul thanks The Honorable Bob Barr of Georgia.